Is there a keener pleasure than not waking up early? 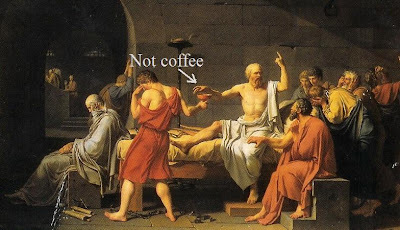 The ancients are silent on the subject, because they were all awake in the morning, and–to my knowledge–miserably without coffee. Today I awoke from my most excellent slumber at an unreasonable hour in order to finish preparing for school. Since that time I have done nothing of the sort. Of all the great night’s sleeps that I’ve had, of which there have been many, there are none that protrude in my brain-memory enough to recall specifics; however, I can recall most vividly several bad night’s sleeps with unholy accuracy and precision. For instance, the night I spent outside the columned keyhole of St. Peter’s Basilica in Rome, or an epic night on Peter’s Beach in Sorrento, or even a few times that I decided to sleep on the couch in the Bar. We remember the bad, not the good, but for some reason, I would rather remember those nights than the nights of drowsy bliss, since to look upon painful experience from from the past is usually an activity of happy remembrance for me. In closing, no one remembers painful experiences on the “weak sauce” scale, they have to actually be painful, and so, I probably will not be remembering the pain of waking up early today. P.S. – I am learning French. It is nasal-intensive. I have a problem (called naivety) with giving phone numbers out to [tricksy] people. Can anyone give me that quote from the Aeneid about looking back and remembering something with joy? Forsan et haec olim meminisse iuvabit, but I had to use Google. Do you know, I've been working overnight part time and after that, you don't feel like sleep is a right, but a treat every time. "Now I can go home and go to sleep!" Those days (which included today) I go to bed sometime after six a.m., when the sun is up or rising. Sleeping during the day seems more luxurious, somehow. « How to Get the University News without actually being in Irving, TX.